The only product of its type available today, this colume combines extra large print, a conveinant size, and a great price in one package. This take-anywhere New Testament is perfect for commuters, hospital visitors, and witnessing. And clear, black type will make it attractive to a wide audience. 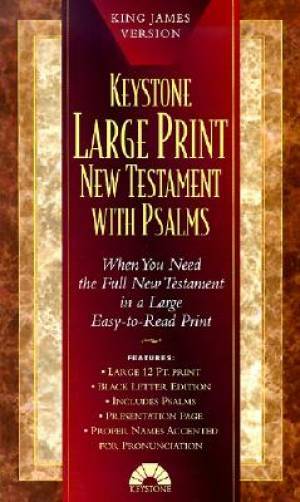 KJV Large Print New Testament With Psalms Black Imitation Leather by National Pub was published by National Publishing Company Bibles in August 2000 and is our 2612th best seller. The ISBN for KJV Large Print New Testament With Psalms Black Imitation Leather is 9780834003415. Be the first to review KJV Large Print New Testament With Psalms Black Imitation Leather! Got a question? No problem! Just click here to ask us about KJV Large Print New Testament With Psalms Black Imitation Leather. A:This bible is in point 10 text size. Thank you for using the Q&A Forum.